So while my fellas were out of the house hunting, I began putting up Christmas decorations. 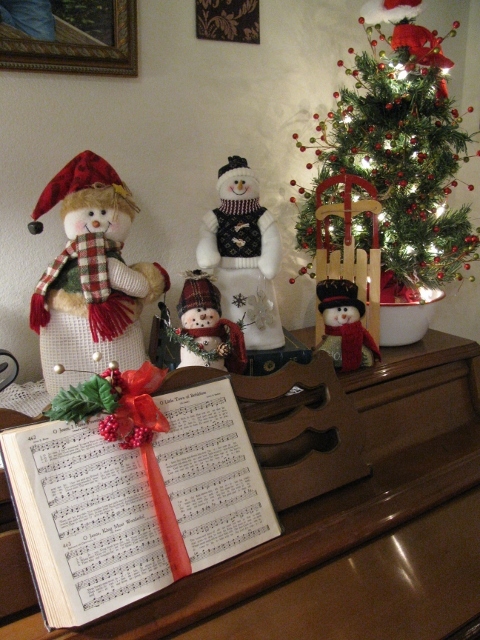 While decorating the top of my piano with a few snowmen, I had an idea! 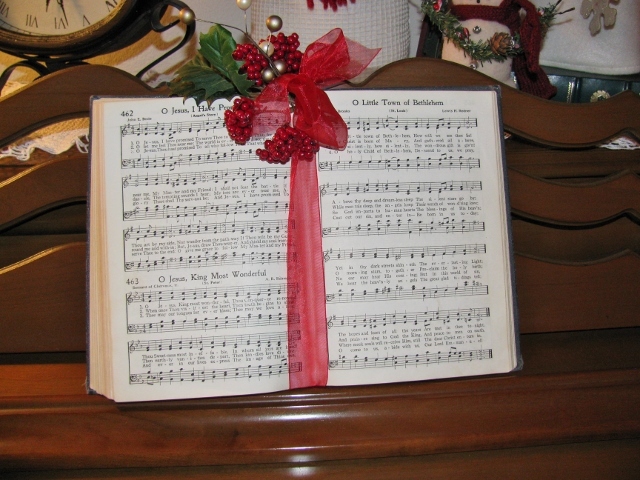 I have an old church hymnal, so I turned to "O Little Town of Bethlehem", tied a pretty red bow and added some berries to mark that page, and then placed it on the music stand on the piano...so simple and pretty!! I love how cute this little display turned out! If you don't have a church hymnal, you can purchase or download sheet music with a Christmas hymn and decorate that before adding it to your music stand as a decoration. Thanks for dropping by today. Be sure to check back later this week for a tutorial on how to make a cute and inspirational frame for yourself or to give as a gift! the ideas are very good.thank giving these thoughts. the teddy bears are so beautiful and nice decoration of Christmas thanks for sharing. wow! so beautiful teddy bears thanks for showing these teddy bears.